Griffin Accessories are basically meant for iPhones. 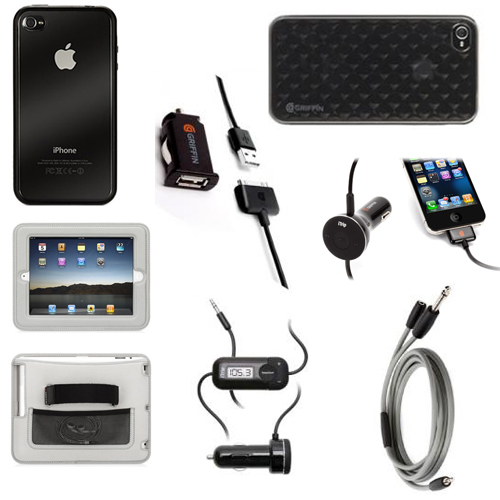 The range of these accessories includes Griffin Cases, Griffin Chargers, Griffin case covers, Griffin Bluetooth and etc. Griffin has wide range of accessories to offer to the users that also according to their needs. iPhone has crosses a long path in last 5 years. As and when it has grown it has also gained accessories which one can never imagine is meant to be for phones. No, I am not here to discuss only about a screen protector or a case or even a stylus. It’s about some out of the blue accessories like radiation detectors, camera kits, GPS cradle; Griffin accessory can be anything which one would have never thought to accessorize a phone. Among the griffin accessories, they have to offer here a brief about a couple of them such as Griffin Reveal Apple iPhone 4/4S Skin Case Cover GB02356 Black (This is among the best of the Griffin Cases, It’s a jet black cover for the iPhone and give the device a classy corporate look), Griffin GA22050 iTrip Dual Connect Play & Charge for Apple iPhone & iPod (It plays a dual role of a charger and also give option of connect & play. This uniqueness of product actually makes Griffin the market leader), Griffin GB02464 CinemaSeat Headrest Case Cover for Apple iPad 2 (This gives a comfortable head space for the user while they are watching a movie on their iPad). This will just make you feel at home). One will also get exciting options of Griffin Bluetooth. For more manufacturer’s accessories, visit Accessories page.